The location of the apartment is fantastic. The Piste is only 100 metres away, so there is no need to worry about driving, parking and walking with heavy equipment such as skis, snowboards, poles etc. You can literally put your skis on at the front door, ski all day and take them off again at the front door when you have finished. Once you are on the ski slope there is a short descent of 250 meters to the Valley Station of the “Achter Jet” ski lift which will take you high up the mountain. 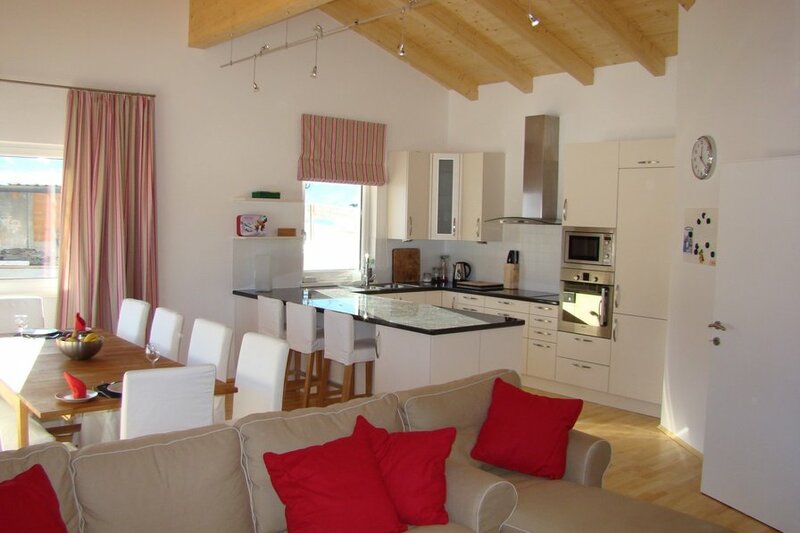 The fully furnished 110 square metre chalet apartment (incl. cellar) consists of three bedrooms, two bathrooms, a combined kitchen, dining and living room all of which have individually controlled under-floor heating. In addition there is a ski cellar. It is located on the top floor of the house, which means that the front door is on the same level as the covered car parking area. This means that luggage and shopping handling is very easy. The main room of the apartment is a large 40 square metre combined living room, dining-room and kitchen. The room has a beautiful pinewood vaulted ceiling, parquet floor and large French windows leading onto a wooden balcony. The views from this room are breathtaking with the Dachstein mountain range in the distance and the Flachau valley and town just below.